How Yemen’s famine got so bad. The Saudi-led war has plunged the country into misery, but it was already vulnerable to this kind of disaster. 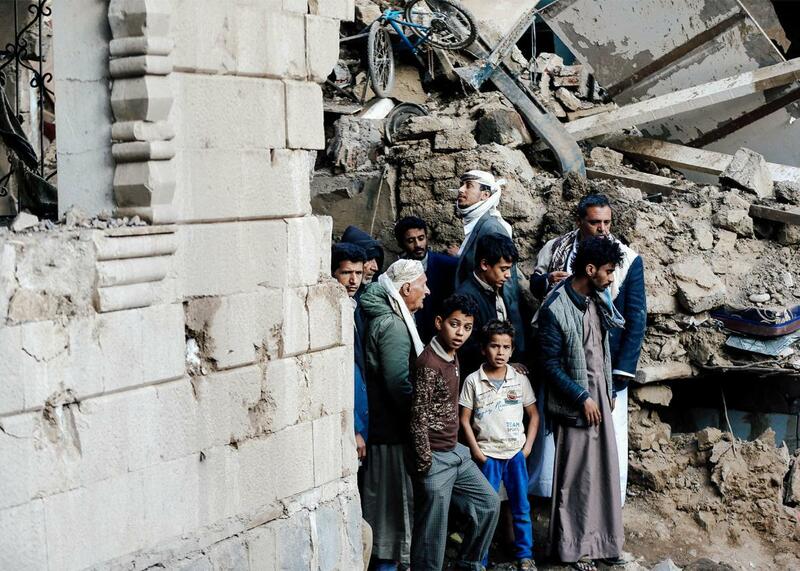 People gather at the site of an airstrike in Sanaa, Yemen, on Nov. 11. The intractable war in Yemen that has been laying waste to the northern half of the country for nearly three years became even more dismal in early November when Saudi Arabia tightened its blockade on the country, cutting a desperate population off from much-needed food aid, medical supplies, and fuel. The blockade was a response to the firing of a missile by the country’s Houthi rebels, who Riyadh considers proxies of Iran, toward Saudi Arabia on Nov. 4, the first time a Houthi strike reached that far into the kingdom. “Iran cannot lob missiles at Saudi cities and towns and expect us not to take steps,” Saudi Foreign Minister Adel al-Jubeir told CNN in response to the attack. But it’s the civilians of Yemen who are feeling the brunt of these steps. The United Nation’s under-secretary-general for humanitarian affairs and emergency relief coordinator, Mark Lowcock, has warned that if the blockade isn’t lifted, Yemen “will not be like the famine that we saw in South Sudan earlier in the year where tens of thousands of people were affected. It will not be like the famine which cost 250,000 people their lives in Somalia in 2011. It will be the largest famine the world has seen for many decades, with millions of victims.” Save the Children announced that approximately 130 children die every day in Yemen from extreme hunger and disease. Photos of emaciated Yemeni children made it to Senate floor last week. Making matters worse, Yemen has also been suffering from the largest cholera outbreak in recorded history, killing at least 2,150 civilians since October 2016. While the spread of cholera recently has been contained, renewed fuel shortages mean clean water cannot be pumped from deep wells, nor transported to vulnerable populations. The International Committee of the Red Cross announced on Friday that three cities—Taiz, Hodeidah, and Saada—had already run out of clean water. “Another outbreak of cholera is a real risk,” Oxfam’s Yemen director, Shane Stevenson, told me. Cases of other diseases, like diphtheria and scabies, have also been reported and hospitals have limited supplies of medicines to treat them. The magnitude of the misery is hard to wrap one’s head around, even in the context of Yemen, a country that has been garnering headlines suggesting it is on the brink of collapse for at least a decade. Yemen’s population is accustomed to survival in challenging circumstances with a government that often worked against them, intermittent tribal warfare, and limited modern conveniences, but starvation and untreatable disease test the deepest of resiliencies. Yemen’s food insecurity has been a concern long before the war began. That’s not an excuse for Saudi Arabia trying to “starve Yemen into submission”—in the words of the New York Times editorial board—but it is important to understand why the blockade is so deadly. Yemen relies on imports for somewhere around 90 percent of its basic food staples like wheat and rice, and has done so for decades. Initially, subsidies had made it cheaper to import than to grow food locally, and while subsidies tapered off in 1990s, the water supply also had shrunk considerably due to mismanagement of the limited resource in such a dry country, making farming more expensive. It still was cheaper to import food, especially as the former government under President Ali Abdullah Saleh gave unofficial kickbacks to import companies as part of Saleh’s vast patronage network. “There is strong reason to believe that the reported $100 million a year it gives to [a major food importer] is used to help keep food prices at affordable levels for the population,” Peter Salisbury, senior consulting fellow at Chatham House’s Middle East and North Africa Programme, wrote in a 2011 report on Yemen’s economy. In the meantime, much arable land was used for the farming of qat, a small tree with leaves that produce a mild high when chewed, as qat could earn farmers the most money. The stimulant is consumed daily by most Yemenis, men and women. Then, Saleh was ousted from power in 2012, his patronage network scrambled, and an already beleaguered economy tanked. Food prices rose in Yemen, just as they also were rising around the world around that time. Then, the bombing started. Saudi Arabia has been waging an aerial campaign against Yemen’s rebel-controlled north, which includes the capital, Sanaa, since March 2015, in an effort to push from power the Houthi rebels and their ally ex-President Ali Abdullah Saleh. The Houthis, a part-militant, part-political group, have been engaged in conflict with the central government since 2004. Among other grievances, the Houthis claimed that the government (which had included their now-ally Saleh) was trying to replace northern Yemen’s distinct Zaydi identity—a branch of Shiite Islam—with Wahabi Sunni Islam, more like what is practiced in Saudi Arabia. The Saudis view the Houthis as an Iranian incursion into their backyard, though the extent to which the Houthis are actually an Iranian proxy is often exaggerated by Saudi leadership, and most recently by the Trump administration, which is supporting the Saudi coalition’s war efforts. When the Houthis took control of Sanaa in September 2014, they had won a decisive battle against some Saudi allies, the Islamists, about which the kingdom couldn’t have been too pleased. The Houthis have been human rights abusers themselves, detaining activists and attacking civilian populations, particularly in Taiz, a city in the country’s central highlands. The war turned a faltering economy into one in free fall. Over the past few years, the Yemeni rial has plummeted time and again. Infrastructure has been destroyed, Saudi Arabia is no longer bolstering the economy of Sanaa as it had once done, oil and natural gas exports have come to a halt, and the central bank, which relocated to Aden, stopped paying government salaries in rebel-controlled areas in August 2016, though salaries had been poorly paid for months prior. Many Yemenis can’t afford what food exists—a gap that aid agencies can’t totally fill even in the best of environments. In a calculated gesture of goodwill, last week, Saudi Arabia announced that ports in the southern half of Yemen would reopen. The south is controlled by the Saudi military coalition and is the unofficial base for Yemen’s government-in-exile. While some aid has entered through Aden’s airport, for example, it will be difficult for that aid to reach northern rebel-controlled areas that are the most desperate. Aden’s seaport also has much less capacity to handle shipments than that of Hodeidah, a port city off Yemen’s western coast that the Houthis control. As Oxfam’s Stevenson put it: “The northern government is feeling the impact of the blockade.” And that’s obviously the point.